A favorite of landscape architects, planners, pedestrians & cyclists, the Meter Hitch bike rack is developed to help maintain parallel parking of bikes so they don't interfere with the right away of streets and sidewalks. Inspired by the dual purpose Bicycle Hitch, the simple Meter Hitch is designed to easily fit over existing 2.38"O.D. 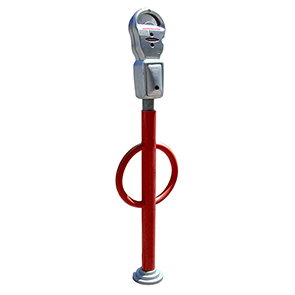 meter poles, providing convenient, economical and secure bike parking. 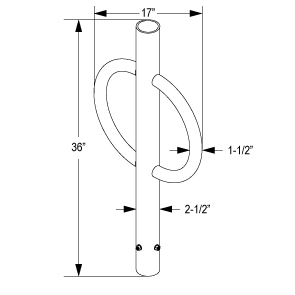 Constructed with commercial grade steel, the bold center post is manufactured with 2.5"O.D. schedule 40 piping and a 1-1/2"O.D. steel tubing for the hitch ring. Featuring a multi-purpose, secure design and a minimal footprint, the Meter Hitch bike rack is able to provide a refined, confident aesthetic and promote community safety. Galvanized or powder-coated finishes are available.